We're in love. Her name is Janie. She's slobbery, licky, sweet, funny and eager to please. 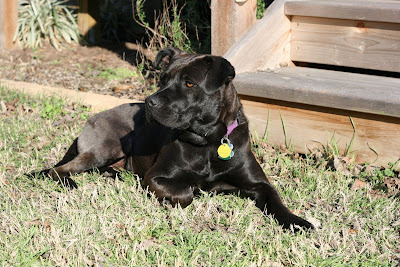 As previously mentioned, Janie came from the awesome people at Blue Dog Rescue. 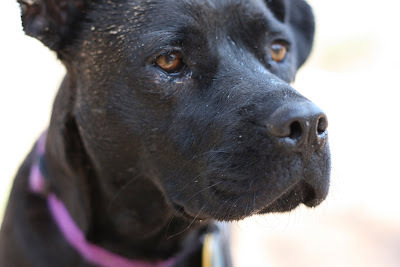 Who knew that we'd fall in love with this forty-pound, Lab-Terrier-mystery-mix back when we were cruising the Wee Rescue (also a great group) website for a small dog? Our friend, Emily, got a Blue Dog Rescue friend and raved so much about Blue Dog that we decided to give them a try. Janie nursed her three puppies in foster care, and was just the best little unwed, teen mother ever. Her puppies all got adopted, but she was still hanging out waiting for us to find her. Janie had hip surgery and eye surgery a few weeks ago to correct some mystery injuries. She's recovering nicely, though she still hops on three legs when she's in a hurry and her eye looks a little teary at the end of the day. Janie goes to work with Chad. She made friends with another dog at work. Janie and Lupita love to wrestle and slobber on each other. They're BFF. I think I need to get Janie a collar to match Lupita's collar, kind of like the necklaces that say "Be fri" on one half and "st end" on the other half, so that you put the halves together to read "best friend". Janie wants to make friends with our three kitties. Feline relations have been polite, if a little tentative. They're all much more comfortable if I'm in the room petting them or brushing them all at once. They'll sniff each other politely, but no cuddling or playing together just yet. Janie is a tiny bit scared of the kitties, whimpering a little on the few occasions that a kitty has hissed at her. Given her size-advantage, that's probably good. Janie loves to chew on things, so we make sure to keep lots of Kong toys and Nylabones around, so that shoes don't look enticing. (Janie, I love you, but stay away from my shoes, please!) Janie loves to give people kisses on the chin or bare toes. She wants people to sit on the floor with her and pet her and rub her tummy. 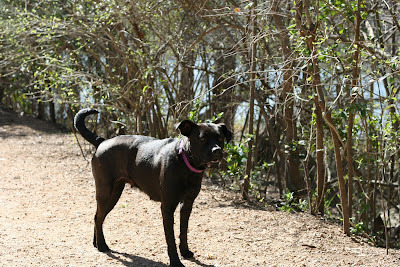 She loves, loves, loves going to Redbud Island dog park to play. She gets along great with other dogs. She gets in the water up to her chest, but hasn't done much swimming yet. 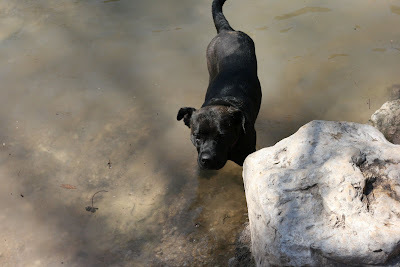 She has webbed toes like her Labrador Retriever relatives, so she'd be a great swimmer if she wanted. Janie knows her name and always comes when called. She is great at "sit" and we're working on "stay". She also knows "shake" but has a hard time balancing right now after her hip surgery. She walks very well on a leash without pulling or straining. Yep, we won the awesome-dog lottery. More photos and anecdotes will follow, I'm sure.